So normally this blog discusses issues relating to deafness etc, has a good moan and chats about how much I love decorating my hearing aids. But I thought for a change I would introduce you to an inspirational deaf friend of mine. 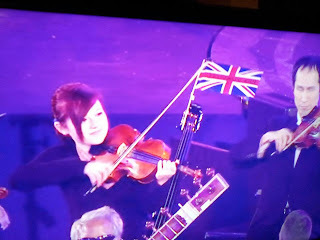 This year she auditioned for, and was picked to be, a part of the Paralympic Paraorchestra! An amazing opportunity to play alongside other disabled musicians as well as Cold Play! She also got a chance to show off her blue ear gear and hearing aids to a national audience... A great way to raise deaf-awareness! Tilly, who plays the viola amongst other instruments, told me "it was an amazing and unforgettable experience, I love the orchestra and will be continuing with them and it was inspirational. Just a very emotional night!" Serious kudos to Tilly for being an amazing role model to other deaf young people wanting to learn to play an instrument. A great example of how being deaf should never hold you back and that you should always reach for your dreams! Well done Tilly, we're all very proud of you!